Getting files ready for publication. It’s a time honored ritual of pain and confusion… Oops, no, that was eating in the cafeteria in grade school. The topic at hand today is getting images ready for publication. Most publishers have requirements for the images you submit for publication. Many of these figures originate in PowerPoint (unfortunately) and that requires some manipulation to meet the publisher requirements. To have explicit control of your output from PowerPoint, I recommend printing the slide to a PDF. A PDF generally preserves the quality of your work and packages it nicely in a nearly universal format. Once, it’s in a PDF, you can use acrobat to turn it into a number of other formats. I hear you saying, but PowerPoint already allows me to save it in a bunch of formats. While that’s true, it doesn’t allow you to control all the variables that make the output acceptable for publication and acrobat does. The default resolution when you make a TIF from in PowerPoint is 96 dpi for example. In acrobat, you can choose File, Save As, Image, TIFF to make a TIFF file, but it doesn’t stop there. Once you’ve made that choice, there is a button nearby that says Settings. When you click on settings, you get choices similar to the ones shown on the left. Notice that the bottom two choices are exactly what the publisher is requesting? Generally, leave the rest of the options alone unless you know all about file compression and color space. 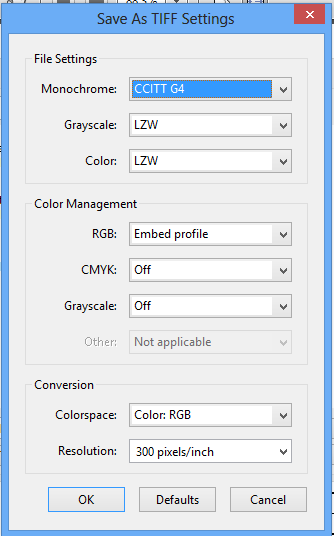 It’s almost impossible to change the color management and have it work anyway unless you know the details of the press being used and have the matching icc profile. And that would only work if your monitor was color calibrated, etcetera, etcetera. So set the bottom two items, choose OK and then Save on the next screen with the name of your choice. Now you have an acceptable image file for publication.